The bad news is I'm having trouble sleeping tonight; the good news is that I came up with another proof of the Pythagorean theorem, to add to yesterday's. 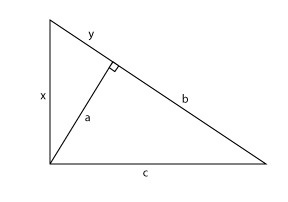 Given a right triangle with sides a and b and hypotenuse c, construct the figure shown below. By similarity, we will have (i) x/(y+b) = a/c, (ii) y/x = a/c, and (iii) x/a = c/b. From (iii) we have x = ac/b, so from (ii) we have y = ax/c = a^2/b, so from (i) we have (ac/b)/(a^2/b+b) = a/c, which simplifies to a^2 = b^2 = c^2. QED. This approach, of course, turned out to be an oldie. Wikipedia presents a similar proof - which, however, takes the "outer" triangle as the object of study, rather than "tacking on" a triangle as I have done. The similar triangles approach is sometimes ascribed to Legendre, but is almost certainly older (e.g. Bhaskara). Truth be told, I came up with this proof by a circuitous route. I realized that the usual cosine addition identity cos(m-n) = cos(m)cos(n) + sin(m)sin(n) can be derived independently of the Pythagorean theorem, and that if we put m=n we get cos(0) = cos^2(m) + sin^2(m). If we grant that cos(0)=1, we have the Pythagorean identity cos^2(m) + sin^2(m) = 1, from which the Pythagorean theorem obviously follows. With this in mind, I found a nice proof of the cosine addition identity at MathWorld; see Equations (49)-(52). To make my proof of the Pythagorean theorem trig-free, I modified the MathWorld diagram by letting h approach x. This explains why my picture ended up looking different than the classic similar triangles approach. Many people claim that trigonometric proofs of the Pythagorean theorem are necessarily circular (see e.g. Wikipedia). Based on the path I took to a valid proof, I think the situation is more subtle. Enter your address below and receive new posts by email. Off-topic comments are deleted. Simple theme. Powered by Blogger.